← What is a scarce book worth? 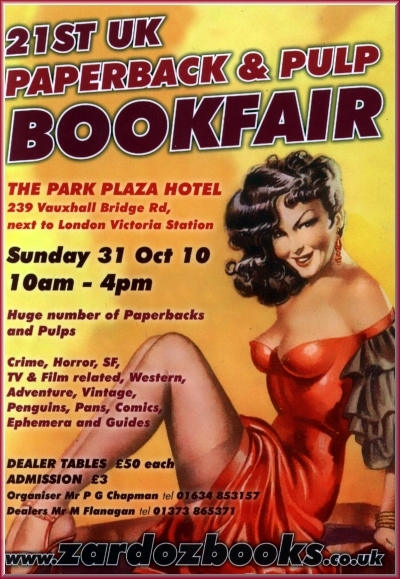 Sunday October 31st sees the 21st “mildly naughty book” book fair — run by Maurice @ Zardoz Books this book fair features some of the best of the genre. And, WHAT A GENRE! Increasingly in a world full of digital, the delightful original cover art is becoming both collectible and valuable. Gotta love ’em! If you’re near London at the end of October then pay a visit. Mention my name to ensure that they add £5 to the price of anything you want to buy! This entry was posted in Books For Sale and tagged book sales, bookfairs, booksellers, collectible books, cover art, cover artists, crime, ephemera, horror, paperbacks, penguin, pulp, sci-fi, sf, sleaze, vintage, western. Bookmark the permalink.